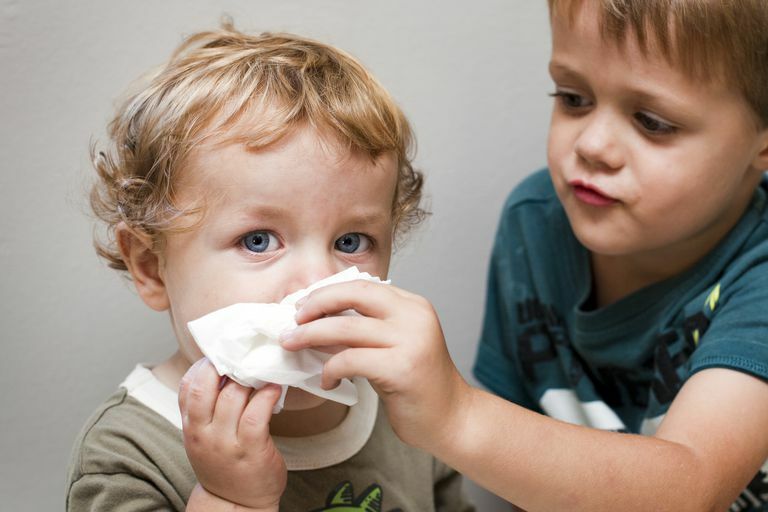 There are a variety of medications available for the treatment of allergic rhinitis in children, which is usually caused by an allergy to pollens. For some children, this happens during the spring, but for others, it occurs year-round. Oral antihistamines are one treatment option, if symptoms are confined to the nasal passages and sinuses, a nasal spray is the preferred treatment. Antihistamine nasal sprays usually take effect within an hour, but work best if used routinely. Nasal corticosteroids reduce the inflammation caused by allergic and non-allergic rhinitis. These nasal sprays help prevent and relieve sneezing and a runny, stuffy, or itchy nose. Corticosteroid nasal sprays need to be used routinely to have any benefit. These medications take many hours to start working, and typically need to be used for a few days before they reach maximal effect. Anticholinergics work by drying the nasal passages. Atrovent Nasal Spray (ipratropium bromide) is available by prescription. The active ingredient in this class of drug is cromolyn sodium. It prevents immune cells (called mast cells) from releasing histamines into the bloodstream. This is an option for families who prefer not to use steroids, but it has to be administered four times per day for best coverage. It is called NasalCrom and is available over the counter. The active ingredient in decongestant sprays is oxymetazoline hydrochloride, an alpha-agonist. It shrinks swollen blood vessels and tissues in the nose that cause congestion and provides relief within minutes. To help soften mucus, saline saltwater sprays can be used, which will cause the mucus to drain more easily—but don't use them right after administering the medicated sprays, as they may rinse out the drug before it has time to take effect. Prescription nasal sprays, especially intranasal corticosteroids, do a better job at treating all symptoms of allergic rhinitis when compared to oral antihistamines. Nasal corticosteroids even do a better job of treating symptoms of eye allergies than do oral antihistamines. The Pediatric Allergies in America Survey found that nearly half of children who used nasal sprays complained that the medication dripped down their throats, causing throat irritation. Other common side effects that children complained about in this study included bad taste, drying or burning within the nose, headaches drowsiness, and nosebleeds. Medication dripping down the throat and bad taste can be prevented by correctly using the nasal spray. Incorrect technique results in many of the side effects from nasal sprays, including nose bleeds. Hold your child on your lap and support him with one arm. Use the other arm to squirt the nasal drops. Have your child tilt his head back slightly. Administer one nasal dose to each nostril, and have him gently inhale the spray. ﻿Always consult with your child's pediatrician before using a nasal spray for your child. Not all formulations are appropriate for all ages. Your doctor can advise you on which ones are safe for your child, and on the correct dosage.